Give the gift of a dance course to someone you care about! Dancing is really fun to learn and it is a skill that you can benefit from your whole life! At Studio-K it does not matter how old you are; we welcome beginners and seasoned dancers alike. In our classes you can put aside your daily life and devote yourself to the music, the rhythm and the movement of your body. It is fun, social and quite useful! Sometimes it takes a bit of encouragement to attend a dance class for the first time, and giving the gift of a dance course can be that exciting first step. Are you interested in giving a good friend a present that they can enjoy for a long time? Order a gift certificate with the formula below and pay to our bankgiro 5320-2644. 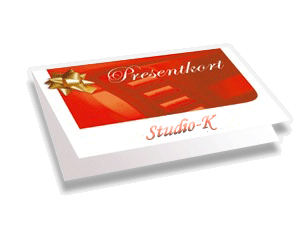 We will then send the gift certificate to you or directly to your friend with a personal message along with it. The gift card will be sent the same day that we receive your payment. If you are rushed and need to expedite the process, we can send an electronic gift card to your email which you can print out yourself the same day! Please contact us if you have any further questions. We do not refund the gift card. Its expiration date can however be postponed for up to one additional year at no extra charge. The card can be used for any dance styles no matter which dance you choose to write it for. Your friend can always use the card for any dance course. But you can also, just for fun, suggest a dance that you think he/she would like. Email (or phone number) of the person(s) that you want to give the certificate to. We need this to send more information to your friend about when the classes start etc.